Thinking about getting your Holiday roll on? K. Well, Thanksgiving is next week! OMGaaaaaah! How did that happen???? So, here is where my head is at: the pleated midi is flames for the Holidays. One. Hundo. And, here's what's so great about it: Olivia Palermo has shown us it's not just for Holiday cocktails, girl. Bust that baby out for day!! I am guessing that Olivia is rocking this beauty by Vince. Also available in red and blue. This metallic blue by A.L.C. is probably my favorite (it's exclusive to Intermix), but the orangey red available at other vendors IS slammin' and I tend to gravitate to a warm red. This deep red by Tibi would be amazing with this black beauty and maybe these babies. 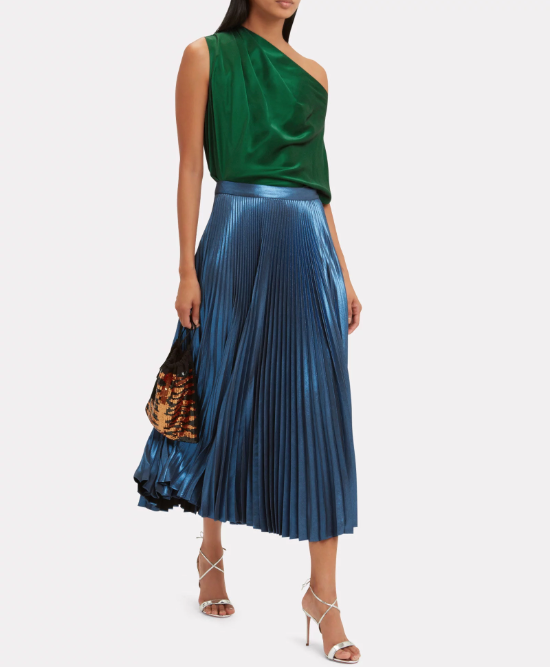 Speaking of tops - can we agree the green silk, off-the-shoulder Michelle Mason top featured with the blue metallic skirt is smouldering????? It's also an Intermix exclusive but definitely an outfit maker. One more thing, find Olivia's fabulous Sophia Websters here.